As a kid from Senegal, West Africa, where the daily life is constantly a battle for a lot of people to eat at their satisfaction. I was very fortunate to be part of a family where my father had a decent job. He was able to take of me and my four other siblings. My parents were unfortunately uneducated, my father was born and raised at his parents village and he used to work day and night at the field. At the age of 20 years old he got the opportunity to come establish a new life in the city of Dakar by himself. I don't know how but he found ways to find a very good job and a couple of years later became one of the managers of a company called GMD ( Grand Moulin de Dakar ). I decided to talk about my fathers story a little to show you where I got my determination as a young man. I started playing basketball very late at the age of 13 years old which was in 2007. Three years later with a lot of hard work and dedication I had the opportunity to go to the United stated by myself at the age of 16 with a full scholarship in high school at a military school called Admiral Farragut Academy. At a very young age I understood the situation I was in and I never took it for granted because where I came from that meant the world to us. Even though it was a great opportunity it was a bittersweet for a lot of reason. Until I was 16 years old I never left the city of Dakar which is the capital of Senegal let alone leaving the country to go live in a different country, not knowing nothing about the place, the people the food and most importantly not even knowing how to speak the language but the outcome I saw in it was bigger than the struggles and the hard times. ( Despite all that I was very excited because I made goals to work hard and get a scholarship in college, get my degree so I can be the first in many generations in family to complete college, to play professional basketball and last but not least to give back to my community in Senegal.) Before graduation high school I was fortunate enough to meet people whom later on became not only friends but families such as the Eaton's and the Aldi's family. As a young man I needed that to keep going. There was time where I almost gave up, because I was so homesick and traumatized with the social life but those people helped me to keep it together. After graduating high school in 2014 I was very blessed to have a couple of scholarship offers from division one ( D1 ) colleges for basketball including the University of New Hampshire (UNH). After visiting the UNH on a weekend I immediately fall in love with the school. It was so beautiful but most importantly the community of UNH was so welcoming. Since most of the sport teams are required to be at school a month during the summer time, that gave me an edge to not only make friends but also figure out what I wanted to study. To be honest there was a couple of majors that I wanted to study but with basketball feeling like another job I wasn't able to do so however I decided to major in Frence and International Affairs with minor in Business and I think that's one of the best decisions I have made in my life. Because the instructors of the language department fully supported me as an student and most importantly as an athlete. With basketball we had to travel a lot and the teachers were so flexible and comprehensive with me, specially Nadine Berenguier, Avary Thorne and Ileana Chirila, whom I want to use this opportunity to thank them so much for supporting and guiding me towards success. I graduated college in May, 2018, and can proudly say I'm the first one in my family to get a degree, in top of that I broke the school rebounding record at UNH, which been held for over 45 years. And i want to make a special mention to coach Dempsey who helped me grow and be successful on and off the basketball court. 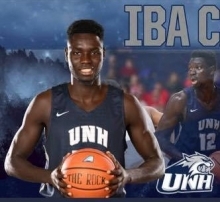 Right after I graduate I had the opportunity to collect basketball shoes from my coaches, teammates and friends and a lot of help from the athletic department of UNH to organize a basketball camp in Senegal, where I was able to invite about 60 kids (girls and boys). I was able to give out a couple of pair of basketball shoes, socks and T-shirts to underprivileged kids. I want to continue to help the people in need in anyway possible and hoping to create a nonprofit organization for that. I was also blessed to sign to start my professional basketball career with Swiss Central Basketball in Lucerne, Switzerland. I'm very happy with the blessings that God has put on my way and I will never take it for granted because I'll keep working hard everyday to make the world a better place. Before I end this I really wanted to thank my my two high schools (AFA and St. Paul's ) for giving me the opportunity to be here at the first place. I will never forget the UNH community, the language department, the athletic department and the basketball staff for helping and supporting me to be the man I am today.